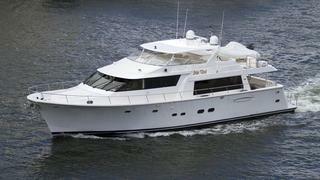 The 26.21 metre motor yacht Me Too, listed for sale by John Varga at Westport Yacht Sales, has been sold with Chris June at Worth Avenue Yachts acting for the buyer. Built in GRP by US yard Pacific Mariner to a design by Gregory C Marshall, she was delivered in 2008 and, with the same owner since new, has never been chartered. A satin finished cherry wood interior accommodates eight guests in four cabins consisting of a full beam master suite with a king sized bed, two VIP suites and a twin cabin, all with entertainment systems, flat screen televisions and en suite bathroom facilities. The large open plan saloon has an L-shaped settee and two barrel swivel armchairs to port facing the entertainment centre which includes a 50 inch plasma television screen on a rise and fall mechanism. There is also a granite topped wet bar, fridge and ice maker while forward is a formal dining area seating eight guests and storage in the buffet for china and crystal. Further forward still, the galley has a settee and table for informal breakfasts and occasional snacks. Outdoors, the aft deck has upholstered seating built into the transom, a table, five teak chairs and a helm station. Up on the flybridge there are three Stidd helm chairs, a settee, hot tub, bar and barbecue sheltered by a hard top while there is tender storage aft. Twin 1,500hp MTU diesel engines give her a cruising speed of 22 knots, topping out at 25 knots. Lying in Fort Lauderdale, Florida, Me Too was asking $3,995,000.